We're heading towards winter, at least in the Northern Hemisphere, which means cozy jumpers, industrial snowfall, and the inevitable onslaught of the common cold. People from Yekaterinburg to Yellowstone can look forward to wiping runny noses and coughing up things that definitely ought to stay down. 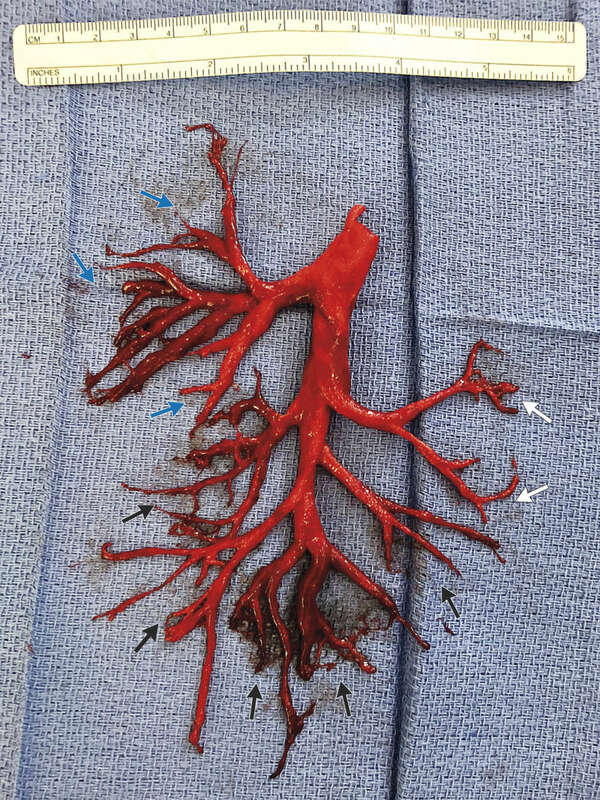 In a bizarre case reported in the New England Journal of Medicine last week, a 36-year-old man managed to “spontaneously expectorate” an intact cast of 10 branches of his bronchial tree. Basically, he coughed up a model, made from his own coagulated blood, of the inside of his lung. Now, it’s fair to say this guy wasn’t exactly the picture of health in the first place. He had already previously suffered a heart failure so severe that only one-fifth of the blood in his heart was being pumped into his body – a normal amount is around three times that figure. He suffered from aortic stenosis – another serious heart problem, where the valve opening between the heart and the aorta, the body’s main artery, becomes too narrow to let blood flow easily. This, in turn, was the result of a congenital defect that left his aortic valve with two cusps instead of three – a condition for which he had undergone surgery to fit a bioprosthetic replacement. And as well as the new valve, he also had a pacemaker, which he needed after a complete heart block had blocked the nerve impulses that told his heart to beat properly. After arriving in the ICU, this collection of cardiac gadgetry got a new addition. Doctors fitted a device to help his heart pump enough blood into his body, and administered heparin, an anticoagulant used to treat blockages in arteries.